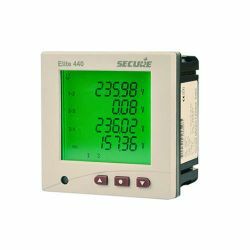 SECURE Elite 440 is a multi-line three-phase digital panel meter for the accurate and reliable measurement of electrical parameters (voltage, current, power, frequency, etc.) for industrial and commercial applications. It has a large multi-line backlit display which enables four parameters to be displayed simultaneously. Modbus communications capability allows easy integration with energy monitoring systems. Expansion modules can be fitted for enhanced system integration (pulse inputs/outputs, analogue outputs or Ethernet).